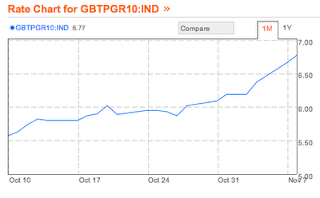 Not sure how much play this is getting in the media, but Italian 10 year bond yields are now above 7% (at right). The country cannot afford to pay that much interest and a vicious cycle looks to be occurring as investors realize this and stop lending. While Europe had a chance to rescue Greece, Italy is the ~10th largest economy in the world and much too big to bail out. Those Euros in your drawer might just be a thing of the past pretty soon. We'll see how the Republicans feel about it tonight during the debate (at 6 MST). 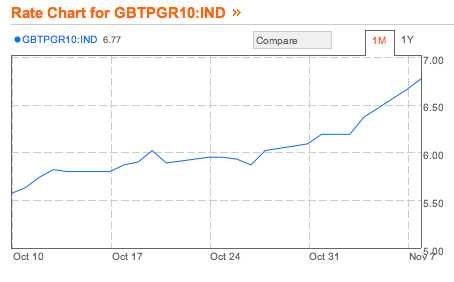 Watch the Euro disintegrate (via Italy's bond yields) here. Watch US markets here. Ezra Klein weighs in here. Ryan Avent of the Economist comments here. And Kevin Drum describes the situation here. Is spending out of control? Should the boomers get off scot-free? Where can one turn for help? Tired of earning 0% interest? Try I bonds. Why all the hate for the 15 year mortgage?